After engaging in a mysterious bonding ceremony with a visiting diplomat, Counselor Troi begins acting crazy and aging at an astonishing rate. Angry old ladies are almost as creepy as placid little girls. "She's just old, senile. Who knows? We could all end up that way someday." That's ironic foreshadowing. The "ceremonial" rocks are in what looks like a tiny black coffin. More foreshadowing! The aliens are just too subtle. I know the budget is limited, but the show can't get away with just putting some make-up on the forehead and calling it a new species all the time. Once or twice is fine, but after a while, it starts to feel like they aren't even trying. Doing a little more with the aliens would have gone a long way here in making the episode a little less mediocre. Why does Riker wait until the next morning to go see Crusher about the giant scratches on his face and tell anyone that Troi is acting like she's lost her mind? You'd think Sick Bay would be his next stop immediately after seeing Troi to her quarters. The old lady make-up makes Troi look kind of like Al Pacino. 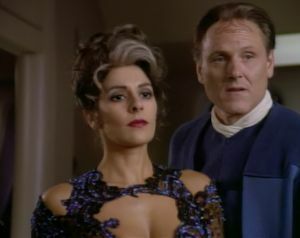 I was getting ready to compliment the make-up artists for their work on Troi, but then they just went ridiculous on her. Why does Picard act so surprised and perplexed to learn that the old lady who came aboard with the ambassador has the internal organs of a much younger woman? Didn't he just see firsthand what happened to Troi? The ending is way too convenient. The diplomatic talks are over (ensuring no ethical greyness); Troi immediately returns to normal; and Alkar dies by some dismissively explained telepathic magic. The story would have been more successful had they gone a little deeper into the "needs of the many" moral dilemma instead of sidestepping it. Plus, whenever you have an episode in which somebody ages prematurely (something that happens with startling regularity in the Star Trek universe), you run into the problem of how to put them back to their younger self by the time the credits roll. Whereas "Unnatural Selection" solves the problem by using time-erasing teleporter technology (that raises all kinds of questions about why people age when they can just beam into a younger body), "Man of the People" just ignores the problem altogether. This episode does a few things right. It's a puzzle show that tries to take a unique twist on the typical "Troi falls in love with a guest star" formula, and it tries to explore the occasionally confusing relationship between Riker and Troi. I also like the image of the crazed old lady as a foreshadowing of what Troi can turn into, and Marina Sirtis' acting is really good. However, the guest star is bland, the pacing is awkward, and the episode can't quite break free from the clichés that TNG has developed over five seasons. For example, this episode, along with the last two, relies heavily on plot devices that are quickly explained away by nonsensical technobabble, as though the writers start with the situation they want to create and then jury rig some sciency-sounding jargon to accomplish it (rather than starting with a speculative concept as good sci-fi should). If you look at the underlying concept here, it's the idea of a diplomat using a member of the Enterprise crew to help mediate an interstellar dispute, something that has been done on TNG at least three times already ("Loud as a Whisper," "Sarek," and "The Host"), not to mention the similarities to "Unnatural Selection" and "Too Short a Season." It seems that the show has fallen into its own formulaic patterns, which has caused a sudden drop in the originality of the storytelling.